Tá sé in am bainne na scoile a h-ordú i gcóir an dara téarma. Má tá bainne ag teastáil ó do leanbh ar scoil i gcóir an dara téarma nó an dara & an tríú téarma, líon isteach an taobh shiar den fhoirm ó Clóna Dairies, a bheidh i mála scoile do pháiste amárach, led' thoil agus seol isteach go Hilda é leis an t-airgead. Muna bhfuil foirm sa mhála scoile agus tá sé ag teastáil uait téir go Hilda san oifig leis an ordú. Is féidir libh íoc agus bainne a fháil as ceann amháin nó an dá téarma le céile. DEIN É SEO CHOMH LUATH IS FÉIDIR ROIMH AN NOLLAIG LE DO THOIL. For the people who have not ordered for the second term. It is time to order school milk for the second term. If your child wants school milk for the 2nd term or the 2nd and 3rd term, please fill in the back of the form from Clóna Dairies that will be in your child's schoolbag tomorrow. If the form is not in the schoolbag and you want to order milk, go to Hilda in the office with your order. You can pay and receive milk for one term or two terms together. PLEASE CAN YOU DO THIS AS SOON AS POSSIBLE BEFORE CHRISTMAS. Tá geansaí Niall Ó Dálaigh (Naí Shóisearacha) in easnamh ó inné. An bhfuil se tógtha ag éinne mar bhotún? Tá a ainm air. Niall Ó Dálaigh's jumper ( Junior Infants) is missing since yesterday. Has anyone taken it by mistake? His name is on it. There was a mistake in the last e-mail that went out regarding Le French Club classes; the price per child is €65 for an 8 week term and not €85 as previously stated. For more information or if you wish to enroll your child for next term please contact: lefunfrenchclub@gmail.com or Natacha on 087-6443574 or 086-1921261. Max’s are still looking for a couple of volunteers for its Gourmet Fundraiser on Thursday 1st December. They need a waiter extraordinaire and someone to help in the in kitchen. Please contact AnnMarie on 021-4772443 or 086-1967587 if you can volunteer. Beidh mé ag cur isteach an ordú deirneach amárach i gcóir na leabhair seo. Mar sin abair liom má tá ceann ag teastáil uait fós. I will be making the final order for the Christmas Annuals (Súgradh, Spraoi etc.) tomorrow. So let me know asap if you still want to order one. Drop your old mobile phones in to the school. If we get sufficient phones it would get the school some fantastic supplies, White Boards, IPADS, Laptops and lots more. There is a box located in side the main door. There is a box located just in side the main door. Tá dáta socraithe so Seó na Nollag. Beidh se ar an 21ú Nollag sa Halla Phobail i mBéal Átha an Spidéal. Naíonáin Shóisearacha ar a 6 a chlog, Rang 1&3 at 7.15. Beimid ag cleachtadh ann gach Déardaoin ó amárach ar aghaidh. Beidh rang na Naíonáin Shóisearacha amháin ag cleachtadh ann amárach. Beigh bus ag fágaint na scoile ag a 9.05 agus ag filleadh ag a 11.45. Gan amhras beidh na leanaí ag teacht agus ag fágaint scoil ag an gnáth ham. We have fixed a date for the Christmas Show. 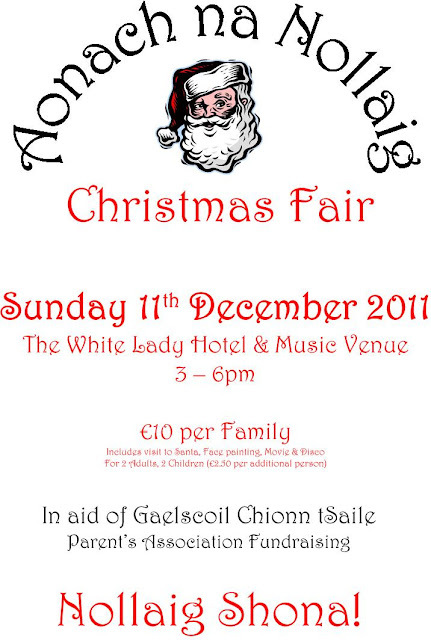 It will be on the 21st December in the Ballinspittle Community Centre. Junior Infants at 6pm, 1st and 3rd Class at 7.15pm. We will be practising there every Thursday from tomorrow on. Only the Junior Infants will be practising there (Ballinspittle Community Centre) tomorrow. There will be a bus leaving the school at 9.05am and returning at 11.45. Of course, the children will be coming to and leaving school at the normal times. Celebrate the Most Wonderful Time of the Year at CIT Blackrock Castle Observatory! Cosmic Christmas at CIT Blackrock Castle Observatory celebrates the festive season with a twist! Suspend your disbelief and visit Santa and his cosmic crew from December 17 – 23 from 11:00 – 18:00 for a natural and traditional take on this special holiday! Remember our gift shop stocks great astronomy and science titles, toys and telescopes. How about some Space Ice Cream; the perfect stocking filler for your little astro-nerd?! A guided and personal tour of the Tower & Dungeon with Lady Castle – €15pp. Guided stargazing is also available for groups of 15- 25 people for €50. CIT Blackrock Castle Observatory are National Coordinators for World Space Week 2011 and Ireland’s official media and outreach representative for European Southern Observatory (ESO), the world’s most productive ground-based observatory. The next meeting for the Aonach Na Nollag will take place at the book covering on Tuesday 22nd of November, 8pm at the Scoil. Book covering at the school will take place on Tuesday 22nd November at the Scoil from 8pm. The more that volunteer the easier the task! Please bring a scissors. Good afternoon. I am e-mailing you to inform your school about exciting new Archaeological finds under investigation at Caherduggan, near Doneraile. Headland Archaeological Company, on behalf of Cork County Council, have discovered exciting new archaeological evidence of a medieval settlement and castle at Caherduggan. This work is being carried out in advance of road realignment. A team of experienced archaeologist are working on the site at the moment and making exciting new discoveries about the past. These archaeological investigations will continue until mid December. This blog provides a wonderful opportunity for the students to share with the archaeologist the excitement of uncovering the hidden secrets of medieval Caherduggan. This is a rare opportunity to gain an understanding how archaeologist work. The blog will be regularly updated with details of new finds, photographs, news, stories etc. It is encouraged that the blog be used in tandem with some of the lessons in the resource pack 'Archaeology in the Classroom – Its about time' such as Excavation in a box and the Timeline; the follow up pack 'Time in Transition' provides a useful power point presentation on the Development of Castles; The Big Dig and the Post Excavation (what happens after the excavation). Both these resources are now available on the web at www.itsabouttime.ie. I am hoping that The Big Dig blog will provide interesting and exciting educational material for you and your students. Please do not hesitate to contact me if you have any queries, my contact details are listed below. I would welcome an opportunity to call to the school at some stage to see how the students and teachers get on with the blog and discuss the educational value of the project. A hard copy of this letter is been send to you in the post today. Please forward e-mail to class teachers and anyone who is interested in local heritage. Also I would very much appreciate acknowledgement of receipt of this e-mail. Mass for 1st Holy Communicants at 6.30pm tomorrow eve!! Mass tomorrow (Sat 19th November ') evening @ 6.30pm in the usual church. agaibh agus, más mian libh, seol isteach iad agus déantar athchursáil orthu. Send them in,if you wish, and they can be re-used. A huge thanks from all at UNICEF Ireland for taking part in our non-uniform day and for raising vital funds for our East Africa Appeal. Please do extend our thanks to all the teachers, secretaries, parents committees and students who took part. As UNICEF Ireland is 100% voluntary funded – we really do rely on as much support from the public as possible to enable us to continue our life saving work in the field. Thank you. I attach a presentation for you explaining exactly what your funds can buy. Its might help bring it to life for the students. Where we work the €181.10 really will go a long way. Thank you so much again and if you would like any further information please do not hesitate to ask. Also – if you have any more amazing photos from this year – please do share them again. Busy Community Centre in the heart of Kinsale owned by the people of Kinsale. AGM tonight, Wed. 16th November, at 8pm. ..or just come to the AGM tonight to find out about what goes on. Bhí meascán maidir leis na seachtainí smáimhe agus ba cheart go dtosnóidh Ranganna 1&2 (Seomra M. Ciara) ar an Déardaoin seo an 17ú ar feadh 9 seachtaine go dtí 26ú Eanair. Beidh costas €99 air. Gheobhaidh siad bus ón scoil ag 1.45 agus beidh siad le bailiú ó Acton's ag 2.45. There was a mix up with the swimming weeks and 1st and 2nd Class (Múinteoir Ciara's group) will start this Thursday for 9 weeks up until the 26th January. It will cost €99. The children will travel by bus from the school at 1.45 and should be collected by yourselves from Acton's at 2.45. As you all know Max's is holding its Gourmet Fundraiser again this year. It is being held on Thursday 17th November and Thursday 1st December. There are still some tables available for early serving at 6.30. AnnMarie still need some volunteers for the 1st December, wash up from 9pm, waiters and 2 parents to prep in the morning. Also Olivier needs two chefs for service and one for prep. Please contact AnnMarie on 021-4772443 or 086-1967587 if you can volunteer. We would like to encourage Parents of Junior and Senior infants in particular! The minutes of Wednesday nights Parents Association meeting are now available on the school website, under Parents Association. Please take the time to read them as they affect your scoil. Karen Ward (Collins), Abby's mum, is class rep for Sinéad's Junior Infants. If you need to contact Karen in relation to any issues or questions you may have you can contact her via email at kcolli01@gmail.com . Amárach an 11 Mí na Samhna, an dáta dúnta i gcóir na boscaí luaighte thuas. Tomorrow, the 11th November, is the closing date for collection of above boxes. Samplaí 'Súgradh', 'Spraoi', 'Siamsa' agus 'Sonas' le feiceáil sa scoil. Is féidir libh ordú a chur isteach le Hilda san oifig as seo amach. €4 an ceann. There are samples of the Christmas Annuals, 'Súgradh', 'Spraoi', 'Siamsa' and 'Sonas' , for you to see in school near the front door. If you would like to order them, you can do so with Hilda in the office, €4 each. Meabhrúchain go mbeidh cruinniú sa scoil anocht ag 7.30. chun na baill tuismitheoirí a roghnú don Bhord Bainistíochta nua.Beidh chathaoirleach an Bhoird Bainistíochta, Gabriel Ó Cathasaigh, ann chun feidhmeanna an Bhoird a phlé. Tá fáilte roimh chách agus molaim daoibh teacht. Reminder that there will be a meeting in the school tonight at 7.30 to elect the two new parents representatives for the Bord of Management. Our chairman, Gabriel Ó Cathasaigh, will be there to talk about the functions of the Bord and its members. All are welcome and encouraged to attend. The Gaelscoil Aonach na Nollag will take place on Sunday 11th December from 3-6pm in the White Lady Hotel. There will be lots of entertainment with Santa, face painting, movies and a disco for the kids, and plenty of Christmas goodies and festive spirit! Hope to see you all there - it's open to the public, so please invite your friends and families! Tá brón orm faoi bhotún a bhí i ríomhphost a chuir mé amach le déanaí. Ceartúchán: NÍL na páistí seo ag imirt peile tráthnóna Dé Chéadaoin agus NÍL ranganna snámha acu go dtí níos déanaí sa bhliain. Apologies re mistake in a recent email. Éinne a d'aistrigh seoladh ón gcéad lá a cláraíodh a leanbh, an féidir leo an seoladh nua seo a thabhairt do Hilde san oifig le bhur dtoil. Tá sé seo an tábhachtach do shonraí na scoile. Anyone who changed address since the day their child registered at the school: If you have not done so already, please give this new address to Hilda in the office. This is very important for school records. Beidh traenáil caide ar siúl tráthnóna Dé Chéadaoin as seo amach de bharr na ranganna snáimhe. Football training will be on after school on Wednesdays from now on because of swimming on Tuesdays. Beidh grúpa Siobhán Ní Núnáin (2 & 3) ag tosnú ar an snámh ar an Mháirt an 8ú Samhain. Mar an gcéanna leis na blianta eile gheobhaidh siad bus ón scoil ag 1.45 agus beidh siad le bailiú ó Acton's ag 2.45. Leanfaidh na ranganna snáimhe ar feadh 9 seachtaine. Beidh costas €99 orthu leis an mbus san áireamh. Tá súil agam go bhfuil sibh go léir ag baint taitneamh as na laethanta saoire! Siobhán Ní Núnáin's group (2nd & 3rd class) will be starting their swimming after the midterm on Tuesday 8th Nov. As with other years the children will travel by bus from the school at 1.45 and should be collected from Acton's at 2.45. Their lessons will run for 9 weeks and will cost €99 including the bus fare. I hope you are all enjoying the break!